I mentioned in a previous post that I wanted to have a giveaway once I reached 200 blog followers and well, I'm at 206 right now! Woo hoo! So to thank all my followers who stop by to visit and take the time to leave me wonderful comments this giveaway is for you. I have two small prizes. All you have to do for a chance to win is of course be a blog follower and answer the following question in the comments section. Where is the most exciting/beautiful/memorable place you have been on a holiday? One comment per person please, and it does not matter where you live in this great big world to participate. I'll take comments until March 10th and then draw two winners. How sweet to have a give-away. Congratulations on reaching 200+ followers. I have been to Europe and Hawaii but I have to say my most awesome moment was the first glimpse of Half Dome and the surrounding area from Glacier Point in Yosemite Nat'l Park. I really dislike mountain roads, hubs drove while I had a nerve wracked ride, but that view at the end of the ride was just awesome, so worth my terror. Hi Sue, Congrats on reaching 200+ followers! The nicest place we've gone on vacation is Jackman, Maine. We rent a little cabin on Moosehead Lake and revel in the absolute quiet and beautiful views. Those both look like great prize packages. Thanks for the chance to win! I won an all-inclusive vacation to Mexico a few years ago ... one week of complete relaxation & pampering ... it was amazing. Thanks for the chance to win. Congrats on your new followers and thanks for the chance to win! So far the best place I've been to is Portland, OR and the Oregon coast. Simply breathtaking. But I'm taking a three week vacation to Europe in October so hopefully I can top that experience! Thanks for your blog and your give-away. I am not much of a traveler but I do love the eastern US in the fall when the colors are glorious. The most memorable place was at a private beach in Port Franks Ontario, Canada where my 2 yr old daughter got to spend a lot of the time enjoying the warm sand and sounds of the waves at the beach. I can see why you have 200 plus followers, I love your cards. Thank you so much for sharing. Of course to win something would be nice. We were fortunate enough to snorkle in the Great Barrier Reef, Australia. It was unbelievable. Congrats on your 200+ blog followers! How exciting! Hi Sue, Love you cards and your creativity. Thanks for the awesome giveaway. I had a beautiful vacation to Mackinac Island, MI in 2011. Its a beautiful island wish I had a house there for summers, but my wish just vanished when we saw a ghost (maybe kind of ghost), first we thought it is our wild imagination but we googled and found that people really have seen some, so I think we saw a real ghost.. But it was a memorable & beautiful trip .. I think my most memorable trip was just last summer to Boston to see Fenway Park for the first time. I am a "Fenway Refugee", living in Oregon, so it was wonderful to see the Red Sox play at Fenway. I loved eating the lobster rolls and visiting Salem and Plymouth Plantation, too. It was a great trip. Thanks for the chance to win! Congratulations!!! This is so sweet of you, and yikes can I pick just one place... I have to say two... one because of the fun and excitement which is NY city... and two Jamaica because it is breathtaking and relaxing and it was our honeymoon! Thank you so very much! China it really was not a vacation but it will be the biggest and the best trip of my life as we adopted our daughter from Cina. Thank you for the chance to win these wonderful giveaways! My favorite vacation so far was to Sweden with my husband back in 2004. Just the right temperatures, a great taste of a different culture, but still easy to communicate and get around, and not overwhelming in terms of things you had to see/do. Congratulations on achieving your first milestone! 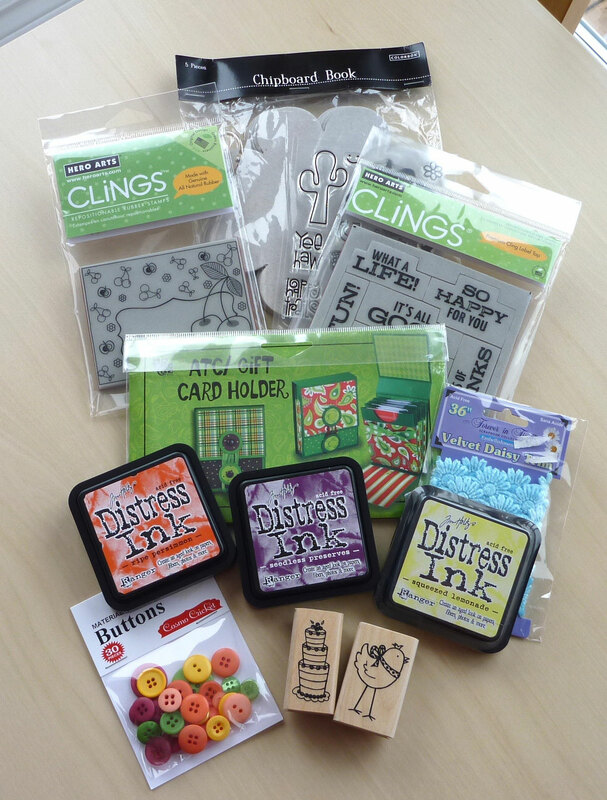 Your cards are very inspirational and these gifts are desirable. My most memorable holiday was as a child at Kosi Bay, on the east coast of South Africa - I still remember the most beautiful little fishes in the tidal pools during low tide. My favorite place has to be Phuket, Thailand. And the Whitsunday Islands in Australia for a beautiful place to be! Congrats on your 206 blog followers! would love to go and see my friend Wanda who lives in California...go to The lake district in England and Cornwall...and Guernsey again and Marbella and oh well so many more places...but home sweet home is great too...with my two sweet rabbits in the garden and my sweet hen...just good weather and a nice book and surrounded by my loved ones...no better place to be! MARGATE, South Africa, for sure. We had rented a little house for real cheap, and were sitting as near the sea we could wish, we had a look through the window and saw the sea, only a road inbetween... The sunsets are so amazingly beautiful, and the sound of the sea goes to bed with you! The most beautiful, peaceful place I have been is the North Shore of Lake Superior in Minnesota. The rugged shoreline and pine tree forest are a place of rest and inspiration. I'm not a big traveler but I think one of the amazing things I've seen is Niagra Falls! It is beautiful! thanks for the chance to win in your drawing. The best place I've been for Holiday is my moms house. I have never gone anywhere else. Thanks for the chance to win! Congrats to 200+ followers. I haven't been yet, but we're going to Tokyo in a couple of months. It will definitely be memorable!! Congrats on reaching 200 followers. So many beautiful places in the world, but just having been back to Cape Town, South Africa, it's stolen my heart again! Congrats on reaching past 200 followers Sue! How sweet of you to do this giveaway, and they are no small prize!! Most beautiful/memorable place I have been on vacation would be Hawaii!! Congratulations on reaching 200 followers! So many beautiful placets. But now I,m still impressed by my vist of Ground Zero. Congrats on 200+ followers! I'd have to say to my boyfriend's lake house in NH. A lovely spot, lots of trees, wildlife and charm. My husband and I went to Curacao several years ago. It was amazing! Hi Sue! Congrats! And thank you for the very nice drawing! You'll be at 500 in no time with your awesomeness! Have a lovely day! That would be Phuket, Thailand - beautiful clear, blue warm water. Big congrats on your 200+ fans, Sue! The most beautiful place I've even been would have to be Paris, for sure! Congratulations on your 200+ Sue! I can certainly see why you have reached that many followers, with the lovely cards you share. I think my most exciting vacation was 11 days in Dublin, then London, many years ago. My 2nd most enjoyable was a month long road trip out west to a lot of the US National Parks, seeing the wonderful natural sites in our country. Thanks for the chance to win the lovely blog candy, but congratulations to whomever wins. I'm a winner already, just looking at your gorgeous cards!!! Hugs. So generous of you to have the Giveaway! You know that I had been to a few places....so the latest one is the Sagrada Familia in Barcelona! 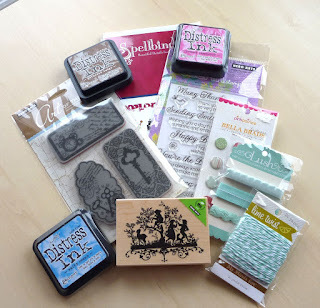 Thanks for stopping by my blog and entering the giveaway! Way to go on so many followers! My most memorable vacation spot was Macanik Island in Michigan. We went for my parents' 50th Anniversary, where THEY had gone for their honeymoon before all of us -- the entire family -- were born. What a unique place! Congrats on your 200 and counting followers - so well deserved! One of the prettiest places we have traveled was to New Hampshire and Maine, beautiful little towns, the coastline. I love that area hope we can return again. Congrats on reaching 200 followers Sue. I'd have to say the Italy would be my fovourite spot to visit again. So beautiful! Congrats on the followers! I don't travel a lot, but my favorite is probably when I went to Bermuda with my husband for our honeymoon! Congrats on crossing over 200 followers :)and have to say that the most beautiful vacation spot I have been to is Goa its got these beautiful beaches and the water is just so perfect ! !